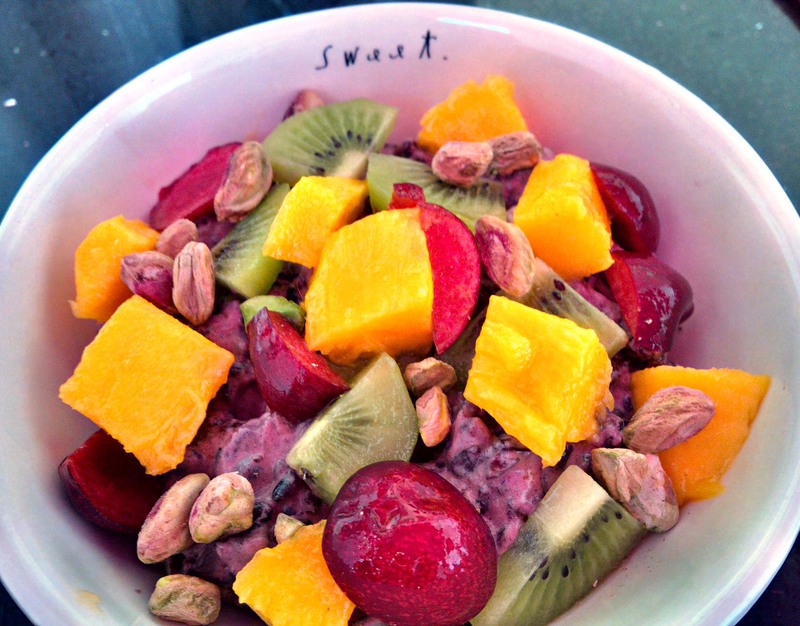 Black rice with coconut, fruit and pistachios – ooooh, mama this is good! I spotted a bag of black rice at the Asian supermarket near me, not having a clue what it was or what to do with it…. Here’s what I’ve learned. Black rice is glutinous or sticky so it’s great for pudding-y type dishes. It’s loaded with antioxidants and has the essential amino acid lysine and tryptophan and vitamin B1, vitamin B2, folate acid and is a good source of minerals including iron, zinc, calcium and phosphorus. (from Wikipedia). It’s also called purple rice or forbidden rice, and frankly, if I were the despotic ruler of ancient China, I would forbid anyone from eating this rice but me. But I’m not. So here’s my recipe for black rice with coconut milk, fruit and pistachios. Prepare to lose your mind over the deliciousness! Some sweetener – I used 1 Tbsp agave nectar, but you could use sugar and as much or little as you like. – Use any fruit you like, but I find the tropical fruits work nicely with the coconut… so would strawberry or raspberry though. Rinse the rice then put it in a pot with the water. Add the spices and sweetener, stir and bring to a boil. Once boiling, reduce and simmer. Black rice takes a while – about 40 minutes. Patience – it’s worth it! Don’t keep lifting the lid on your rice pot… let it do its thing. The rice is done when the water is all absorbed… the rice will not be fluffy. It’ll be sticky when done. If you used cardamom pods and a cinnamon stick, fish them out and dispose. When the rice has cooled, add a can of coconut milk. This is optional. The rice is good enough just as is, but the coconut milk adds delicious decadence that life requires, in my opinion. Top with the diced mango and kiwi (I also added a few slices of cherry) and pistachio. Enjoy!! The rice makes 4 servings.